Tom Zusi's performance from Copelia earned him a spot in a national ballet competition. by Chris Meehan and Sean Connolly. Photo by Siggul/Visual Arts Masters. Tom Zusi, 15, a ninth-grader at Trinity School at Greenlawn, finished second in a regional ballet competition in Indianapolis in early March, beating dancers from across the country. 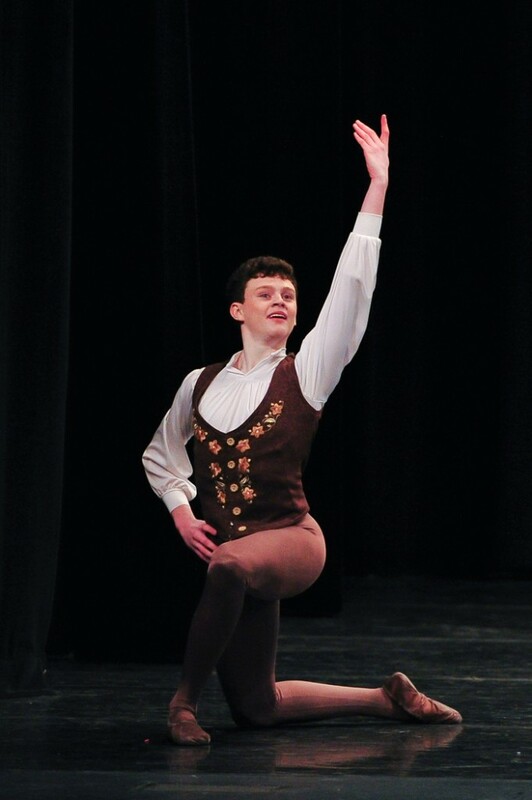 His performance of “Franz’s Variation” from Coppelia earned him a spot in a national ballet competition in New York City in April. The Indianapolis semifinal was sponsored by Youth America Grand Prix (YAGP), “the largest student ballet scholarship competition in the world,” according to the YAGP web site. It brought together more than 500 student dancers representing 72 dance schools from 18 states, Canada and Japan. 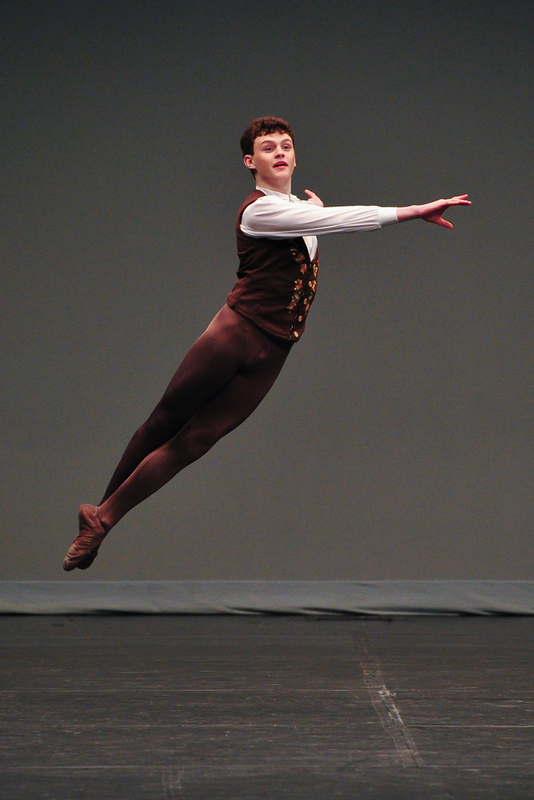 Tom competed in the junior division as a member of South Bend’s Southold Dance Theater. He is the son of Mike and Nora Zusi (South Bend). “I’ve been rehearsing since early August, so I was ready,” says Tom. In fact, Tom has been doing ballet since he was three, part of a family tradition that includes his four siblings (Lily, 16; Paul, 12; Julia, 10; and Ben, 9) and their mother, Nora. Stephen Sanford, son of Russ and Ruth Sanford (South Bend), and a principal dancer at the Grand Rapids Ballet in Michigan, was less surprised. “It was wonderful news to hear about Tom’s performance,” he said. Stephen taught Tom in a weeklong intensive class last summer and got to congratulate him in person last week. Tom Zusi finished second in a regional ballet competition in early March. Mike and Nora admit that it’s not an easy job, managing a household of seven, six of whom have ballet commitments and two of whom are students at Trinity School, while Nora homeschools the three youngest and two more community children. Mike works full-time as a program manager for Honeywell Aerospace, serves on the People of Praise board of governors and is head of the Action program office. “Our family couldn’t do what we do without the support of the community,” says Mike. Congratulations Tom, you look like you're flying. Way to go, Tom! Great job! Awesome! Way to go, Tom!! How wonderful! You look so graceful! Tom, you are a wonderful inspiration to so many young and old! Keep up the great work. that is truly an honor - congratulations! Wow, Tom, what grace and balance! I bet you'd make a great quarterback! By the way, who did the amazing photography? Wow.. Great Job Tom. Can't wait to see you in a major performance. Tom, How inspiring and delighting to hear your story and achievement.Congratulations to you and to your parents! Tom, How inspiring and delightful to hear your story and achievement.Congratulations to you and to your parents! Boy, wish I could jump that high! Great job. Congratulations! Tom, this takes a lot of discipline. Congratulations on a job well done! Awesome! What an incredible performance! Beautiful!! What a great performance. So very inspiring, Tom. I can't imagine the amount of hard work that you have invested in this. I only wish we had a link to a video of the entire performance.